Close-up of Jupiter's Great Red Spot as seen by a Voyager spacecraft. On a rooftop in downtown Atlanta, a group of scientists are cooking up alien atmospheres. Their results will help astronomers understand the data that NASA's Juno spacecraft will send back from Jupiter in 2016. Jupiter's cloudy bands and great red spot are visible with an amateur telescope. But the elements that compose them are more challenging to detect. As the largest planet in the solar system, Jupiter was most likely the first to form from the gas and dust that once circled the young sun. Details about its past provide clues to the early history and formation of other planets, including Earth. But the planet has closely guarded the secrets of its atmosphere. Jupiter's radiation belts block the lower frequency radio waves that provide details about of the lower atmosphere. Juno will overcome this problem by utilizing a path that avoids these belts. But without something to compare the readings to, the signal will be indecipherable. That's where the simulator, which is essentially a pressurized oven, comes into play. Gases are assembled at a range of temperatures and pressures within, and scientists can then measure a variety of conditions that Juno is expected to record on Jupiter. "We can mix together different 'recipes' for the Jovian atmosphere and place them in our simulator," Paul Steffes of Georgia Institute of Technology told SPACE.com in an email interview. Steffes and his team have created over 5,000 different simulations of gases, changing temperatures and pressures to greatly resemble those that might be found on Jupiter. Each of these potential signals is being recorded for reference later. When Juno begins broadcasting the details of the planet's cloud layers, scientists will be able to match the spacecraft's findings with the simulated conditions to determine the true atmospheric composition in various locations and mixtures across the planet. The simulations have already helped scientists identify the atmospheres of other planets. "Our results have been used in interpreting radio measurements from Cassini at Saturn, and even older measurements made with Voyager at Uranus and Neptune," Steffes said. Paul Steffes and Danny Duong, both of Georgia Tech, examine the instrumentation on a machine used to simulate atmospheres on alien planets. 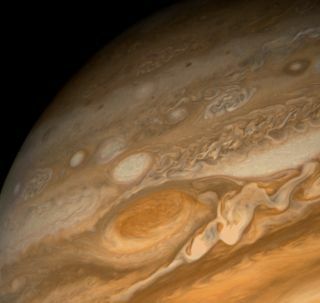 Key among the questions scientists hope to answer is how much water vapor is present in Jupiter's atmosphere. This would help scientists understand how water survived the hydrogen-rich solar system. Previous reports of water on Jupiter have been conflicting. When the Comet Shoemaker-Levy smashed into Jupiter's surface , it kicked up oxygen that indicated water in the atmosphere might be plentiful. But, later data seemed to contradict these findings. "In 1995, the Galileo probe detected some water on Jupiter," Steffes said. "But the location was thought to be a very dry one, and not representative of the entire planet." The amounts returned were less than astronomers expected to find. Since then, astronomers have struggled to determine just how much water vapor is in Jupiter's air, but so far, the search has been without success. This should change once Juno enters into orbit around Jupiter. Using the references created by the atmosphere simulator, Juno's MWR will not only find the water, it will also be able to determine its altitude. "The real question Juno MWR will address is the global inventory of water," Steffes said. "This will be key to understanding the process by which Jupiter was formed." Follow SPACE.com for the latest in space science and exploration news on Twitter @Spacedotcom and on Facebook.